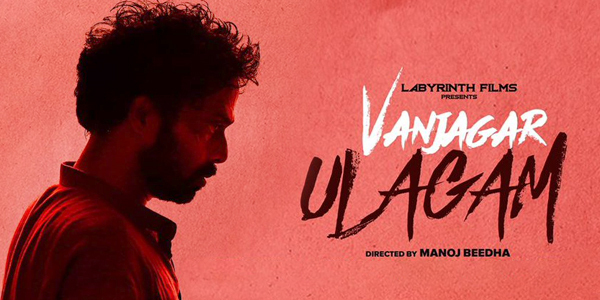 'Vanjagar Ulagam' has already made everyone raise their eyebrows with its trailer and unique tone of promotions. The film which is directed by Manoj Beedha stars Guru Somasundaram in the lead role. Other lead characters of the film are Anisha Ambrose, Hareesh Peradi and John Vijay. Chandini Tamilarasan is also essaying an important role in this movie.The director has joined hands with Vinayak V to come up with the screenplay. Vinayak has written the story and dialogues of the film as well. Sam CS has composed the music score for the film with editor Anthony making the cuts. Two cinematographers have worked for the project namely Rodrigo Del Rio Herrara and Saravanan Ramasamy. Labyrinth Films is bankrolling the project which is slated to hit the screens coming August 31st.